Valley Fire Pieris, or Dwarf Alberta Spruces? 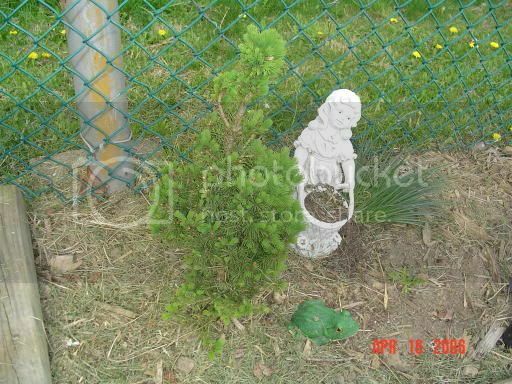 I just bought some of them the other day at walmart.....I wanted to add a little evergreen growth to the bed I have along the chain link fence. I've been wondering how big the Pieris will get....on the tag it just says slow grower. I have both, but I don't know the variety of my pieris. My MIL wanted to get rid of it because it kept over-growing it's place. I would call it a relatively slow grower, but they can get large if left to grow. The spruce is a VERY slow grower. I bought mine about 6 years ago at about 18". They are now about 4 feet. They will get very tall though but it takes many years. My mother planted one in her yard about 25 years ago and I would guess its about 15-17 feet now. Hope it helps give you a little idea. Thanks John , I was beginning to think nobody out there had them. I hate how places lie ....I read that they get 4-6 feet...I should've known better...but being such a slow grower it won't be hard to keep them in check. The pieris had some interesting white flowers on it, and the new foliage is bright red.....I'll have to move it eventually to a better spot where it can expand.....either that or I'll keep it pruned. 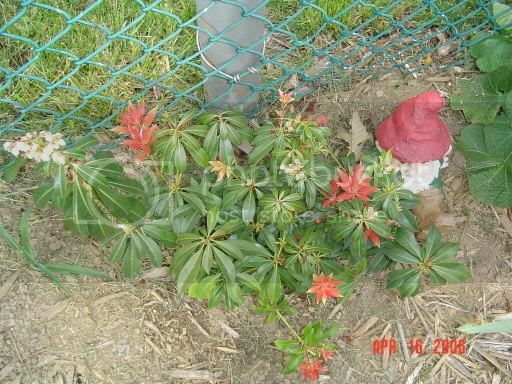 I have Valley Fire Pieris planted in almost total shade. I love the red foliage and mine has the white on it now. It's about 4 feet tall at this point. It's been there 3 years and I've never pruned it. I'm sure they grow faster in the sun but it's been healthy and has always flowered in the shade. I had dwarf alberta spruces for 5 years, started out about 12" and only grew about 1/4" a year. They weren't yet 24" in 5 years. The pieris I had (dont know variety) grew slowly too. maybe 1/2" a year. The one at the house where I grew up was about8 or 9 feet tall maybe 4' wide, it was still there when we sold the house so I watched it for close to 30 years and it didn't get any bigger. Wow you guys, thanks for the info....slow growing is okay with me...I just wanted to add something evergreen to the flowerbeds! One of my Dwarf Alberta Spruce Trees. keep an eye out for spider mites on the dwarf alberta spruce, that is the one pest that can devastate them.